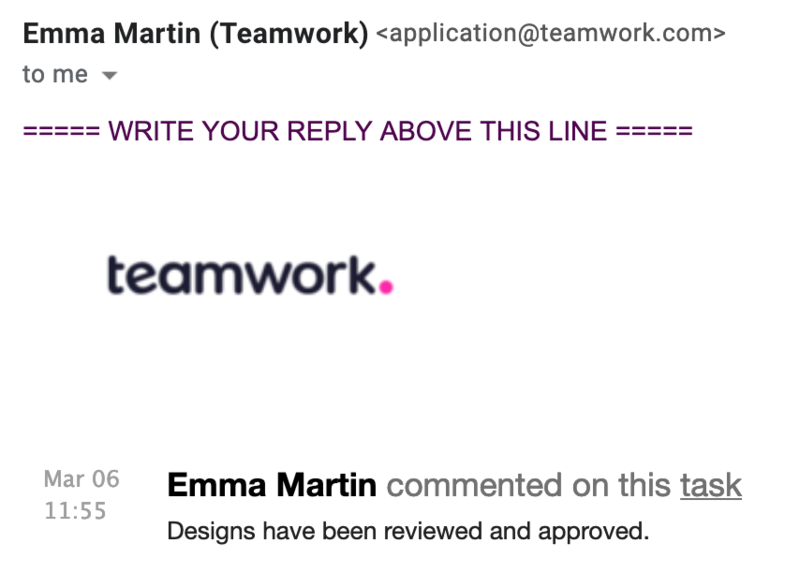 Within Teamwork Projects, you can reply to messages and comments via email. When you add a new message/comment or reply to your project, you can choose to notify people of that message/comment or reply. If you have the Reply by email option enabled in the project settings, the people who receive the notifications can reply to them directly from email to add their own replies. Reading a comment via its email notification will mark the notification as read in the app and bell. Those people can reply to the email from their email client (such as Outlook, Thunderbird, or Gmail) and their email will be posted as a reply. Note: It is important to make sure that reply content goes above the line in the email. Note: Any replies by email will also notify anyone who was in the original notification list.